Carpenters do it with big wood. Doctors do it while you turn your head and cough. Teachers do it with yard sticks. Lawyers do it in front of a jury of their peers. 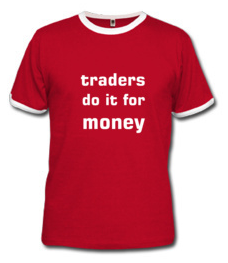 Traders do it…. Drop your wit in the comments below. No kiddin’. Make sure to leave your correct email so I can get in touch with you for mailing and size info. Look! Warren has started buying! Dude, just make sure we save enough money on our losses for beer. Dude, whoa! When you said you were going to show me something I didn’t think - yeah you should probably get tested…. My English is not really good. Don’t worry, the new stimulus package includes a lift of the hair trading ban. See this, this is cousin IT and if you lose me one more million cousin IT is going to pay a visit to your colon. Look! There are women present! Either zip up, or cover your shorts! Hey Baldy. You look at my woman one more time and I’ll take that Credit Default Swap and shove it so far up your a$$ not even the Fed could bail you out! Now put down the Goldman Sachs. Success is not enough; one’s peers must also fail. Whoa!? Did you say Jill is checking out my a$$!? 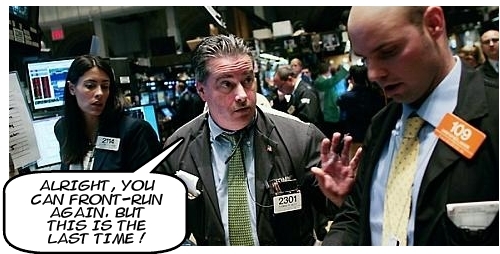 Don’t be mad at me but I bought a credit default swap on you losing all of your hair. Futures and options trading involve substantial risk. The valuation of futures and options may fluctuate, and as a result, clients may lose more then their original investment. we get 70 virgins in paradise, ok. i’m buying at market. Jill: You call that a stimulus package! Joe: Hey, Put that thing away! Thanks for entering the contest. I’ve contacted the winner and will be sending them their prize.